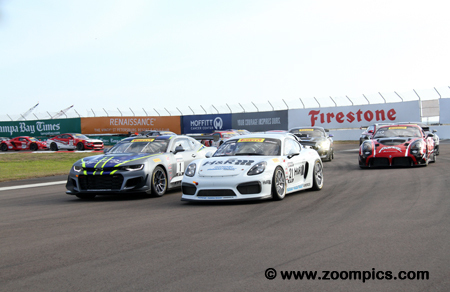 The 2018 Pirelli World Challenge season is the twenty-ninth consecutive year for the championship. There are four race weekends (eight races). This is quite a contrast from 2017 when Grand Touring Sport competitors raced in eighteen events to determine the champion. 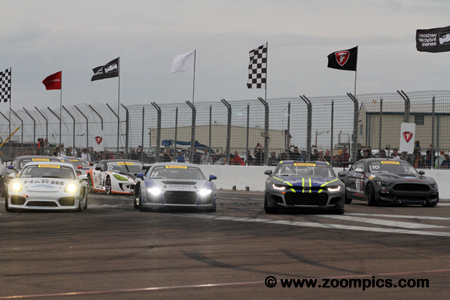 The Grand Touring Sport category title chase kicks-off in March at Saint Petersburg. This event is followed by races at Canadian Tire Motorsport Park and Road America. The finale takes place at Watkins Glen International on the Labour Day weekend. 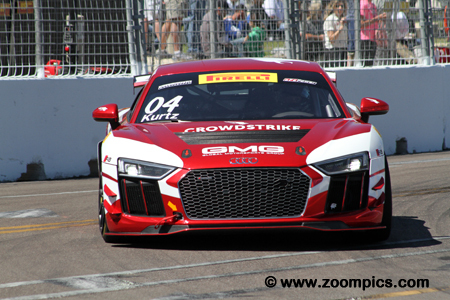 The opening rounds of the 2018 Pirelli World Challenge championship for the Grand Touring Sport cars were held at the Grand Prix of Saint Petersburg. Drivers would compete in two fifty-minute sprint races around the fourteen-turn 1.800-mile temporary street course. 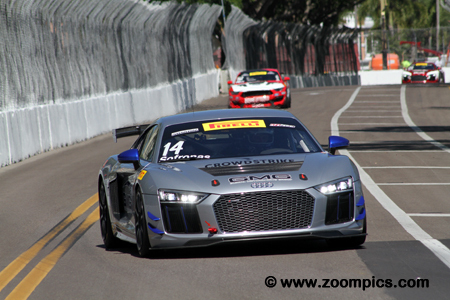 The Grand Touring Sport grid enters the first turn at the Grand Prix of Saint Petersburg for round one of the 2018 Pirelli World Challenge championship. 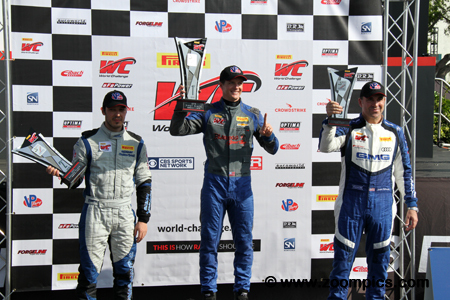 From left to right is the pole-sitter, Gabriele Piana in the No. 21 Porsche Cayman. 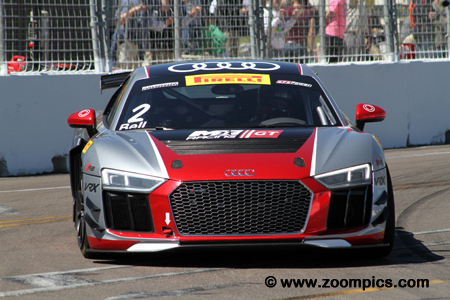 Next to Piana is the Audi R8 of James Sofronas who qualified second. Up from fourth on the grid is the Camaro of Lawson Aschenbach and rounding the outside is the former Trans-Am competitor, Vinnie Allegretta. 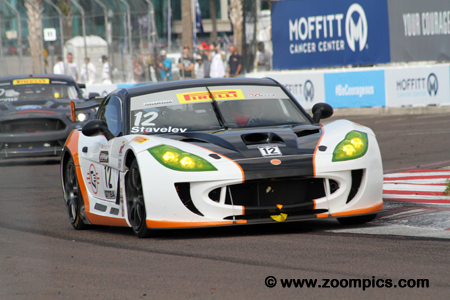 Utah’s Drew Staveley qualified sixth overall and second in the GTSA category racing a Ginetta G55 prepared by Ian Lacy Racing. As the start of Saturday’s contest, Staveley lost places but some errors by other competitors allowed him to move up the lap chart and finish third overall and first in class. The following day he was gridded seventh and scored another class victory. Italian driver, Gabriele Piana drove the No. 21 Porsche Cayman GT Clubsport MR. Piana set notice early on that he was going to be a contender – topping the timesheets in both practice sessions and qualifying. The pole-sitter was passed by Lawson Aschenbach on the opening lap and had to settle for a second place finish in race one. On Sunday, Piana was unable to mount a challenge and collected the runner-up spot. 2017 GTA and GT SprintX Pro-Am champion James Sofronas exchanged his Porsche in 2018 and joined the GTS category in an Audi R8 LMS GT4. The GMG driver qualified second for the season opener but contact with Jade Buford during the race dropped him down the order. Sofronas fought back and finished fourth in class. On Sunday, he fared much better – Sofronas was gridded third and captured the final spot on the podium. No one spent more time on the podium at Saint Petersburg than Drew Staveley. Staveley won the GTSA category both days and finished third overall on Saturday. Standing on his left-side is the third place GTSA finisher, from the Blackdog Speed Shop, Tony Gaples. On the other side of Staveley is the runner-up, Toby Grahovec from Classic BMW. 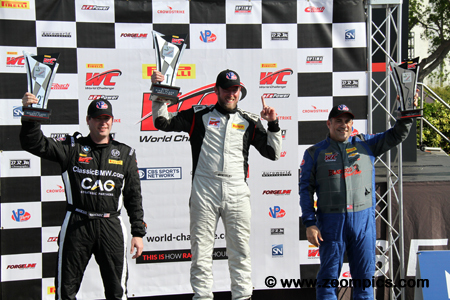 Five-time Pirelli World Challenge champion, Lawson Aschenbach was back on form in the season opener. Aschenbach qualified fourth for race one but an aggressive start by the defending champion put him into first place on lap-1. He went on to win by a margin of 0.547-seconds. The following day, Aschenbach started on the pole and led flag-to-flag for his second consecutive victory. Finishing second Saturday in the GTSA category was Mike Hedlund in the No. 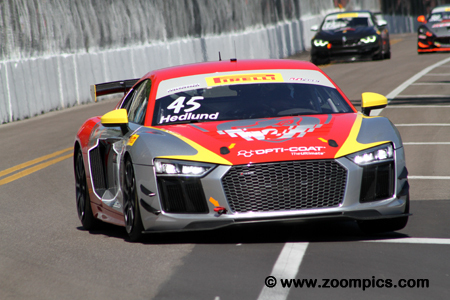 45 Flying Lizard Motorsports Audi R8 LMS GT4 – he started seventh overall and third in class. 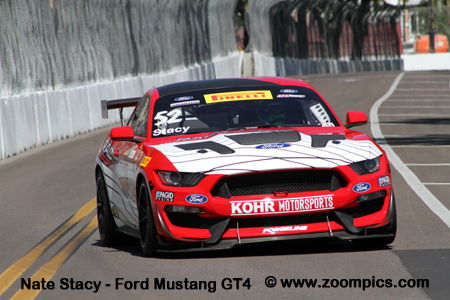 In round two, Hedlund was gridded eleventh overall and fourth in GTSA. At the checkered flag, he was fourth in class and twelfth overall. Twenty-eight Grand Touring Sport competitors line-up as they exit the last corner (turn fourteen) in anticipation of the Starter’s green flag. On the pole for round two, as the result of his fastest race lap on Saturday is Lawson Aschenbach in the Blackdog Racing Camaro. Sharing the front row with Aschenbach is yesterday’s pole-sitter, Gabriele Piana in the Muehlner Motorsports Porsche Cayman. Topping the time sheets in GTSA was the 2017 class champion, George Kurtz. For round one, Kurtz qualified fifth overall driving the No. 04 CrowdStrike/GMG Audi R8 LMS. He was in contention for the class victory until he suffered a flat tire and parked the car. On Sunday, Kurtz encounter more problems - damage during the opening lap caused him to go off-course at turn fourteen – he was the first to retire from the race. 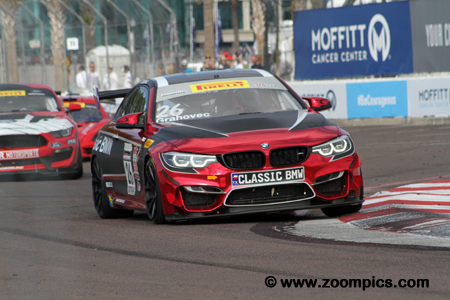 2016 Touring Car champion, Toby Grahovec led a team that included three BMW M4 GT4 entered by Classic BMW of Dallas. In the weekend’s first event, Grahovec started fourth in GTSA and was gridded ninth overall. He dropped out of contention – finishing twelfth overall and fifth in class. On Sunday, Grahovec's performance was much better – at the checkered flag he captured the runner-up position in GTSA. Tampa resident, Jason Bell scored a GTSA victory at VIR in 2017 driving a SIN R1 GT4. This season, Bell is competing in the pro category driving an Audi R8 LMS GT4 prepared by M1 GT Racing. He started tenth for the season’s first race but an incident between James Sofronas and Jade Buford and the retirement of George Kurtz allowed him to grab the final spot on the podium. On Sunday, Bell finished fourteenth overall. The GTS podium for round two at the Grand Prix of Saint Petersburg. 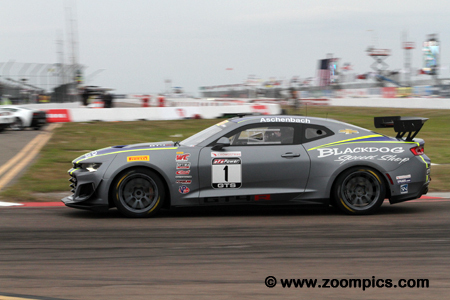 In the center, taking his second consecutive victory of the weekend is the driver of the Blackdog Speed Shop Chevrolet Camaro GT4, Lawson Aschenbach. 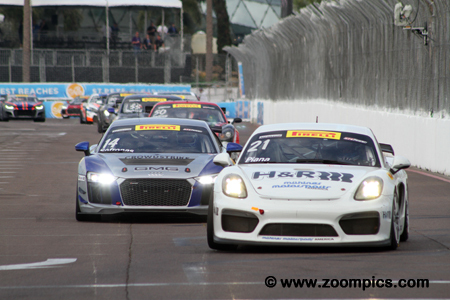 To Aschenbach’s right is the runner-up and newcomer to the Pirelli World Challenge series, Gabriele Piana. Completing the podium is the series veteran, James Sofronas.